A new book of essays was released on October 1st. The Unique Legacy of Weird Tales is the last of Rowman & Littlefield’s Studies in Supernatural Literature volumes. Sunand Tryambak Joshi was the editor of this series that made it to seven before getting the headman’s axe for poor sales. Joshi stated he had no interest in doing more popular writers such as Stephen King or Dean Koontz. The series might have lasted longer had he done so. Lovecraft and Influence: His Predecessors and Successors, edited by Robert W. Waugh. Lord Dunsany, H. P. Lovecraft, and Ray Bradbury: Spectral Journeys, by William F. Touponce. Critical Essays on Lord, edited by Sunand Tryambak Joshi. Ramsey Campbell: Critical Essays on the Modern Master of Horror, edited by Gary William Crawford. Lord Dunsany: A Comprehensive Bibliography, Second Edition, by Sunand Tryambak Joshi and Darrell Schweitzer. Disorders of Magnitude: A Survey of Dark Fantasy, by Jason V. Brock. These books go for $80.00 a piece. I doubt local libraries are going to have these in the catalog. The book comes out at 266 pages, 6.2 x 9.3 inches, 1.2 pounds. $80.00 for hardcover, $55.49 for kindle. The contents range from sub-genre surveys to literary theory academic wankery. Some of the literary theory essays may not be to everyone’s taste but hopefully the reader may get a take home point or new piece of information. My essay covers the evolution of sword and sorcery fiction in Weird Tales which started out as gothic stories with swords and evolved into its classic form due to the influence of H. P. Lovecraft’s cosmic horror. 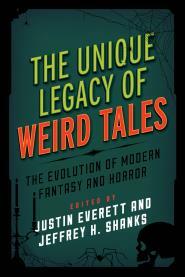 This is the first academic book on Weird Tales that I am aware of. Good to see serious appreciation of a serious genre that has not received the respect it deserves. Maybe this will change things. Is this a second musical youth of Oldfield?